I hope you all had a glorious Easter. We did! We had a beautiful morning at church, with no baby crying for once! Andrew excitedly made a connection with today's Scripture reading, always a sweet moment. 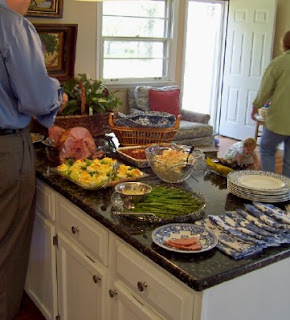 I was lucky enough to host Easter lunch after church--lots of good food, family, and sunshine, despite the chill. Since my table is small, I generally let guests help themselves to a buffet lunch. I'm still learning how best to arrange things here. Having lived with tiny kitchens, all this counter space is a blessing I *truly* appreciate! oh! Is that Boiled Custard i spy on your dessert buffet : ) ? Soooooo lovely. Thanks for giving us a peek into your home! Also.... 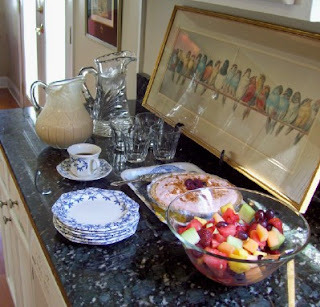 I do so like the framed print of birds you have propped on your counter. I passed one by at a resale shop a while back, and regret not purchasing it. Do you know the artist? Or any "tracking info"? Thanks! Mmmm split pea or lentil soup. . . . Happy Easter to you and it looks like you had a great day. What a blessing for you! Place bone in large stock pot. Pour in a 97 cent bag of lentils. Pour in water to almost cover the bone. Boil for an hour or too - et voila, enjoy your lentil soup. You can pull the bone out just before serving and chop off little bitsies of ham to float around in it. My husband always puts a schploop of sour cream on his soup. This looks great! The food is all so beautiful. I always love making split pea soup with leftover ham bones. What a lovely lunch it looks like you had! I recommend this recipe for your ham leftovers. I use the ham bone to make stock in the crock pot and use that instead of the water and chicken bullion. Oh wow, your display of Easter food and decor looks so nice!! !